Since the mid 1990s, First Nature has been publishing books and free online information about the natural world, its wildlife, wildflowers fungi and habitats. Run by Pat O'Reilly and his wife Sue (who writes as Sue Parker), the First Nature website contains over 2000 web pages and receives more than 3/4 million visits per year. An active conservationist, Sue is the author of 12 books and several dozen articles on wildlife and countryside topics; she is well known in the Algarve for her column on Sustainable Living, which is published monthly in the Algarve Resident newspaper. Sue’s latest book, Wild Orchids of the Algarve - how, when and where to find them, provides a wealth of additional information on orchid ecology, taxonomy, top orchid sites and walks in the Algarve; its the essential handbook for Algarve residents and visitors alike. Sue has also produced and maintains the Algarve Wildlife website, whose pages are visited nearly 200,000 times a year. Pat O’Reilly’s fascination with fungi, wildflowers and wildlife stretches back more than 40 years and has taken him to many countries; but, as he says, there is a special satisfaction in finding and identifying things close to home. Writing and broadcasting on wildlife and countryside topics for more than 30 years, Pat is the author of more than 20 books and hundreds of articles. 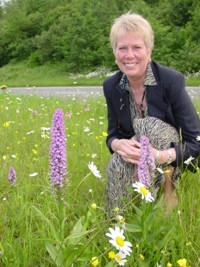 An active conservationist, Pat has chaired and served on several UK government advisory committees and special commissions. 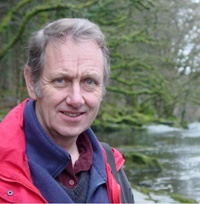 Until April 2013 he was a board member of the Countryside Council for Wales - now Natural Resources Wales - where his special interest was in fungi conservation (he is a Member of the British Mycological Society) and the management of National Nature Reserves in Wales. For his environmental work Pat O’Reilly was awarded an MBE in 2003. The quickest way to contact us is by email. Whenever we are away we have email access and can normally respond to emails within 12 hours (and often by return). For guidance and email address details see below. If you wish to send pictures of wildflower or fungi species with a request for help in identifying them, please attach no more than two pictures (or one picture if larger than 3MB in size) with any one email; this ensures that email gateways on the Internet do not prevent your attachment getting through. We are always delighted to receive potential contributions to the First Nature website. In particular, pictures are very much appreciated and we do always reply. Often we are able to show the pictures on either new or existing pages. When someone enquires via First Nature about using a picture that belongs to one of our contributors, we transfer the enquiry to the owner of the picture, and any royalty fee is payable directly to the copyright owner (not via First Nature). Please note that we do not have a budget to pay for the use of pictures, and we cannot guarantee that display of your pictures on the First Nature website will necessarily result in other people offering to pay a royalty fee to use your pictures elsewhere; however, several million people will have an opportunity to enjoy your pictures, and we think that is something to be proud of. When submitting pictures for consideration please email them as attachments, in JPG format if at all possible. (Depending where they are sent from, files larger than 10MB may be blocked by some email gateways.) For large pictures, therefore, it may be safest to send each picture via a separate email. Alternatively, where you have a lot of pictures to offer it may be simpler to send them on a CD or a DVD by post to us at the address below. With plants, it is very helpful (and sometimes essential) to see the leaves as well as the flowers.